With Bluetooth V4.2 technology, this waterproof speaker allows 33ft wireless transmission range. You can hook it up to the devices without Bluetooth function via 3.5mm audio cable for great music. Our intelligent technology, LOBKIN X9 serve as a remote shutter,for making selfies super easy to take on the press of a button. Enjoy crystal clear, bass rich music while hiking, camping, picnicking, fishing, on the beach, by the pool, in the shower, at home, in your office, Anywhere. Without worrying that water, sand or dust could do any damage to your speaker. Rated waterproof level IPX6, it can resist low to medium pressure water splash from any angle. Not submersible but can withstand accidental drop in water. Dry before use if submerged in water accidentally. Safety use in the shower, in the rain, by the pool or on a boat. No more scrambling for the charger - the X9 lasts for up to 10 hours playing time between charges. Plug it into the adapter, and it's fully charged again in under 3 hours! The suction cup attaches strongly to glass, ceramic, or any other smooth surface in the shower or anywhere. 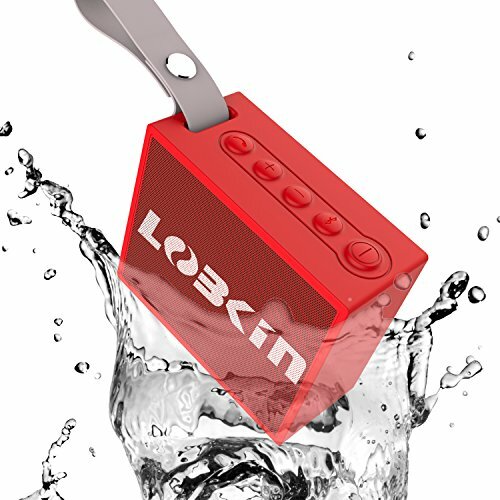 Every LOBKIN product includes a 45 days money-back and 12-month, worry-free Guarantee!